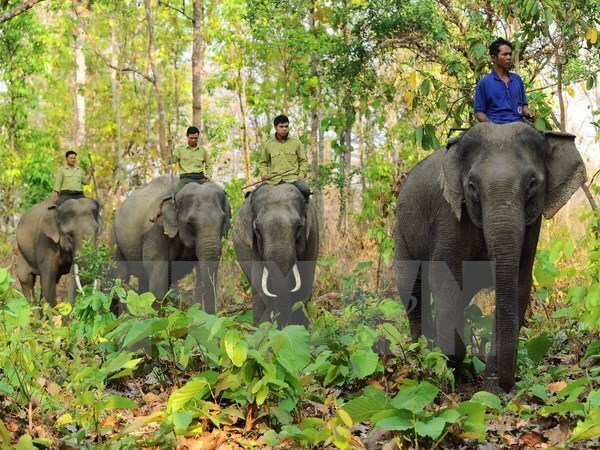 Quang Nam (VNA) – The Vietnam Administration of Forestry in partnership with the US Agency for International Development (USAID) announced the establishment of an elephant sanctuary in central Quang Nam province on September 7. The sanctuary covers nearly 19,000 hectares in Phuoc Ninh and Que Lam communes of Nong Son district, and a buffer zone covering about 25,000 hectares sprawling over nine communes of the districts of Nong Son, Dai Loc, Nam Giang, Phuoc Son and Hiep Duc. The launch of the reserve is part of the USAID-funded Truong Son Xanh (Green Annamites) Project, aiming to support Vietnam’s transition to climate-smart, low emission, and resilient development that targets people, landscapes, and biodiversity in the central region, with a focus on Quang Nam and Thua Thien-Hue provinces. A recent survey by the Vietnam Administration of Forestry identified at least seven elephants living in a group in the reserve. Speaking at the launching event, Vice Chairman of the provincial People’s Committee Le Tri Thanh said many wild species in Vietnam and the world are in danger while decrease in natural forest coverage has caused loss of wildlife habitat. In that context, the elephant sanctuary plays a significant role in protecting elephants and other natural resources and ensuring eco-balance and biodiversity in the province, he added.